Aerial view of Interstate 70 and town of Avon, Colo.
Colorado hasn't been this contentious about its forests since 1907, when Gifford Pinchot himself had to stare down insurgents assembled in Denver. It's a different cast of characters now: Here on Colorado's White River National Forest, it's not cattlemen, lumbermen and miners who are bellyaching - it's recreationists. On a forest that stretches from the Continental Divide, just an hour's drive westward from Denver's expanding suburbs, into the heart of western Colorado, the Recreating West has rushed in hard on the heels of the Extractive West. Sightseers and mountain bikers have shooed off the lumbermen and appropriated old logging roads. And every hunting season, all-terrain vehicle drivers blaze new trails onto the land. Hikers, cross-country skiers and snowmobilers every year make it more of a year-round playground, while downhill skiers account for 7.5 million visits a year. All this recreation is beating up the White River, which covers almost 4 percent of Colorado. Now, instead of accommodating every request that walks in the door, the Forest Service's Proposed Revised Land and Resource Management Plan seeks to reassert loyalty to the land itself. But with many users, the agency's preferred alternative is not going down well. In Edwards, Colo., 115 miles from Denver, at a meeting of some 30 builders last month, talk swirled nervously around the White River National Forest and its draft plan. Eagle County Commissioner Tom Stone pointed to a map that identified in red every road the plan would close. Running across the 3,700 square miles of national forest, the red lines looked like a cardiovascular diagram in Gray's Anatomy. Backcountry skiers, the bulk of the state's ski areas, dirt bikers - all face restrictions, he said. Why? "Politics," explained the county commissioner. "The decisions are being made back in Washington," Stone insisted, and "they don't care because there's just eight electoral votes from Colorado." A real estate salesman told the builders that if the White River plan is adopted, it will make "remodeling contractors' out of them. Another real estate agent muttered that the plan will turn the forest into a drive-by forest - -a tree museum." A builder warned, "Did you know that the road to Thomasville will be closed?" The Thomasville road won't be closed. But the rumors have taken on a life of their own. No main roads will be closed; side roads will. The forest plan envisions decommissioning 22 miles of roads each year, but 1,500 miles of roads currently open to drivers of full-sized vehicles, such as Jeep Cherokees, will remain so. In addition, nearly 1,700 miles of trails will remain open to dirt bikes and all-terrain vehicles. This 16-pound plan is anything but radical. In closing roads, the Forest Service shows only slightly more ambition than it did in 1985, when the agency disgorged its last zoning document. Few people reacted then; this time there's a loud outcry. In the 18 newspapers published in Vail, Aspen and other towns along the edges of the White River National Forest, almost daily stories raise new concerns; forest officials expect as many as 5,000 signed comments about the plan. Not just a Colorado issue, the 15-year plan emerging here is a national issue. Even Congress has gotten into the act. After the Forest Service voluntarily added 90 days to the public comment period, Colorado Sen. Ben Nighthorse Campbell attached a rider to an appropriations bill, extending the comment period a full nine months, to May 9, 2000. To Ski Magazine, the plan is a cause for national concern: "This document represents something of a surrender by the Forest Service to the vocal minority of environmental groups who simply want our sport to go away," wrote editor Andy Bigford in the November issue. "If this proposal becomes national policy, we may end up forfeiting all kinds of recreational opportunities from coast to coast." Sounding even more outraged are snowmobilers, who would find their access to winter trails reduced by 56 percent. The plan's preferred alternative still allows them some 500,000 acres to roam, and much of the territory they're losing lies in areas where few sane snowmobilers would venture. But reduced turf is still the point, insists Randy Parsons, president of the pro-motor user group, White River Forest Alliance. He says, "We must take immediate and drastic action to preserve our right to use public lands." Almost everyone who reads it offers some caveats to the White River's plan. With its preferred alternative, the Forest Service has taken a stand: As big as the White River National Forest is - and it is the 11th largest of the nation's 154 national forests - it is still too small to be everybody's personal playground. One hundred years ago, Pinchot - the father of the Forest Service - asserted that the federal government had the right to manage its timber reserve tracts; now, the Forest Service is reasserting its right to manage what has become in part a giant outdoor gymnasium. "They've been sleepy in the recreational world," says Vera Smith, public-land policy director for the Colorado Mountain Club. "They're playing catch-up. They're not doing anything radical. They're doing what they should have been doing all along." While the forest plan merely trims and restricts some uses, leaving most more or less intact, its language is gruff. The agency's summary of its preferred alternative D bluntly warns: "Little or no off-road motorized or mechanized travel is allowed. Summer motorized travel is reduced and concentrated, and there are fewer open roads. There are fewer total road miles." A pugnacious approach is far from the friendly, accommodating, but firm style of the White River's Supervisor, Martha Ketelle. After a career with the Tennessee Valley Authority, she joined the Forest Service in 1992, the same year the agency's ecosystem approach was adopted. She assumed head duties on the White River two years ago, after the plan revision was already under way. Representative of the new breed of forest supervisor, she has three master's degrees, none of them in forestry. Her relative newness to the agency has created a few problems, say colleagues, though they also credit her with quick learning. One thing she's learned is that the mood of Colorado's Western Slope has shifted, as doubts have grown about the ability of the forest to absorb recreational use - doubled since the mid-1980s. In response to one survey question, for instance, 83 percent agreed that "more importance should be placed on keeping forests healthy than on helping people use them in ways they want." This coincides with a shift in the philosophical mooring of the Forest Service. The White River plan was prepared largely under the aegis of the Natural Resource Agenda issued by Forest Chief Michael Dombeck two years ago, and its preferred alternative embraces the Dombeck principle that higher priority be given to physical and biological resources than to human uses of the forest. These are fighting words for those who believe that recreation is next to godliness on the public's lands. But environmental groups such as The Wilderness Society and the Boulder, Colo.-based Biodiversity Legal Foundation see the Forest Service finally turning in the right direction with this plan. One example: Although Alternative D calls for adding only 47,200 more acres of wilderness out of a possible 298,000, wilderness supporters say that's far more than other forests in Colorado have proposed. Altogether, four other revised plans recommended only 8,000 acres for wilderness designation. With 80 percent of wilderness in Colorado mostly "rock and ice," what's needed, say wilderness activists, are roadless lands below 10,000 feet, where biodiversity expands. The White River plan recommends wilderness additions in just those areas around the Flat Tops. "It's a giant step forward," says Jasper Carlton, executive director of the Biodiversity Legal Foundation. "You've got to compliment the Forest Service. I didn't think they had it in them." The plan also draws praise from loggers. Because fire was suppressed for most of the last century, spruce, fir and lodgepole pine forests have become even-aged and dense; to promote diversity, the agency sees stepped-up logging as a crucial tool. That forestry precept is found in all but one of the alternatives for management. The exception is Alternative I, which was assembled by the Aspen Wilderness Workshop, a coalition of environmentally concerned groups and individuals. The alternative's approach embraces the principles of conservation biology, leaving large core areas to nature, and linking those areas with roadless, undeveloped corridors for wildlife migration. Only on the forest periphery does Alternative I envision intensive management. "To think we can exclude fire is delusional," says the workshop's Sloan Shoemaker. And fire, he insists, is not the same as logging, since cutting removes biomass and fire recycles it. Loggers aren't entirely comfortable with the agency's view of cutting trees as a means instead of an end, yet Gary Jones of the Colorado Timber Industry Association says he's happy with the agency's preferred Alternative D.
"You can't do it with fire," he says of forest management. "And you can't do nothing; that would be disaster down the road. "It's an unusual partnership," he adds, "and it hasn't been completely worked out yet." Loggers and many environmentalists are finding common ground; can bedfellows get much stranger? The forest plan's proposal to obliterate two well-used trails in the Maroon Bells-Snowmass Wilderness Area didn't evoke much hiker response; but the White River Forest Alliance, with a $75,000 budget augmented by state and national motor groups, carried on an extensive radio advertising campaign in which they warned that the plan would kick even hikers off the forest. In 1984, fat-tire mountain bicycles were so few the forest plan made no mention of them. Bicycle use mushroomed 214 percent during the subsequent dozen years. Now, mountain bikers can go almost anywhere outside of wilderness. And they do. On hillsides like that between the Beaver Creek Resort and the Eagle-Vail subdivision, mountain bikers have pioneered trails with names like Polly's Plunge and Oso, the latter so-named because a) a bear (oso in Spanish) was seen nearby, or b) because of what somebody might say (-Oh S--- Oh'), as they look down their handlebars at the steep plunge below, where the earth has been scraped clean of vegetation. Such "pirate" trails braid the White River National Forest, particularly near the more heavily populated ski areas. Fearing continued growth, the White River's plan proposes to confine mountain biking, as well as skateboards and in-line skates designed for dirt, to specific trails, and to close access to all other trails. Many mountain bikers say the agency doesn't know what it's doing. "Everybody's gut feeling is that trail users impact wildlife," says Martha Rozowski, executive director of Bicycle Colorado. "What we don't know is how much of an impact." Gary Sprung, communications director for the International Mountain Bike Association, which represents 15,000 dues-paying members, says that while land managers can't always wait for the science, "you also don't act arbitrarily and capriciously." However, Charlie Tarvar, owner of Hub of Aspen and founder of two bicycling clubs, says the preferred forest plan "is a wonderful compromise." He estimates he spent 100 hours working with the agency on the plan. In Vail, well-known mountain biker Dawes Wilson has been courted by both environmentalists and motorcycle riders. He says he feels no affinity with motorized users but warns against giving hikers and horseback riders preferred status in the backcountry. "I think it will push bicycle riders more toward motorized organizations," he says. "I think that would be unfortunate. "If wildlife is the big concern, which it seems to be, then it seems wrong to leave no restrictions on pedestrian travel," he says. "It seems to me that the user group that most affects wildlife is a pedestrian with a dog." He says non-motorized users should be treated the same or the Forest Service should "come up with some hard evidence to make us feel differently." Wilson also hints at civil disobedience if bicycle trails are closed: "I don't think it's going to work, I don't think it can be enforced." The "where's the science?" argument is also voiced by some backcountry skiers. Their numbers have grown 16 percent since the last forest plan was adopted, and backcountry ski huts - including the nationally known 10th Mountain Division huts - have more than quadrupled. At the same time, forest carnivores have been pushed to the brink of extinction - or perhaps over the edge. The Forest Service's response is a new "primary zoning" to protect animals such as wolverines and Canada lynx. 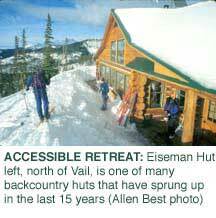 That primary zoning of 116,000 acres would reduce snowmobile terrain and might also quash more backcountry ski huts. At the very least, any new trails would have to be balanced by the abandonment of existing trails. The theory is that lynx do well in powder snow because of their enormous paws, which are as as big as a mountain lion's. But coyotes and other predators can attack lynx during the make-or-break time of midwinter by traveling on skier or snowmobile trails. The theory is not universally accepted. "The burden should be on them to prove that our presence has a detrimental impact upon lynx," says Tim Casey of Breckenridge. "I don't think they can prove it." Casey is a founder of the Summit Huts Association, a group which has several more huts planned. Backcountry ski huts are relatively new. Downhill skiing was the 800-pound gorilla on the White River before, and downhill skier numbers have grown more than 24 percent since 1986. The new plan would largely limit, but not eliminate, ski area expansion. That includes Summit County's four ski areas, which together mass more skier days than all of Utah; as well as Vail and its sibling, Beaver Creek, and, to the west, Aspen's four ski areas. Altogether, the ski areas chip in $7 million a year to the U.S. Treasury, while costing the Forest Service only $350,000 in administrative costs. The Forest Service predicts the ski areas will be able to accommodate only 1 percent growth in business, as opposed to to a projected growth of 2.6 percent, for the next several years. The result would be crowding, and also a decrease in quality skiing, since powder snow is a casualty when the slopes are groomed to accommodate the greatest numbers of skiers. Aspen Skiing Company has endorsed the Forest Service plan, while asking for more wilderness and other modifications. Vail Resorts says it is "baffled" and has "condemned" the plan. However, it already has the continent's largest ski area, and it just got larger, thanks to a controversial expansion into a roadless area known as Category III (HCN, 12/7/98). The loudest howls have come from resorts in Summit County, 90 minutes from the Denver-Boulder metropolitan area's exploding 2.5 million population, which is expected to add another 1 million more people by 2020. Having survived and thrived even as aging baby boomers slowly retreat from physical activity, these ski areas have begun to see the arrival of the "echo generation." Vigorous and affluent, the new generation has numbers (72 million in the United States) that approach those of their parents (78 million). "The plan doesn't give us the flexibility it should," says Breckenridge chief operating officer Rick Sramek. "Keep in mind, it's not permission," pleads Arapahoe Basin's Jim Gentling. "We're just asking for the zoning." In the past, the agency has usually given the zoning, and then the permission. Now, for almost the first time in 40 years, the Forest Service's response to ski-area assumptions about entitled growth is a polite: "How come?" Environmentalists have long criticized the Forest Service for being too permissive. Ski-resort expansions are market-driven - an "arms race," Colorado Wild's Jeff Berman says. That arms race is not primarily about sliding downhill, says another critic. "It's the real estate market for second homes that is really driving the ski industry, not developing skiing for skiing sake," Kevin Knapmiller says. Why should the Forest Service be a partner in jacking up the price of adjacent private land? asks Knapmiller, president of the Blue River chapter of the Sierra Club. The agency's preferred alternative could dramatically change the business of skiing. Although there have been plateaus and even declines, the ski industry has always been based on growth - more lifts, more skiable terrain, more houses. Now, at the geographic heart of the industry, the Forest Service is flashing the "go slow" sign, and hinting that a full stop signal may be ahead. Nowhere in the Forest Service's documentation of its preferred alternative is its essential philosophy better explained than in a memorandum submitted by the Colorado Division of Wildlife during the planning process. "We believe the people have the right to recreate on their national forests," staffers said, "but not necessarily at all times and with any travel method that they choose. "We also believe that the Forest Service should not necessarily accommodate every new recreational pursuit that comes along, particularly mechanical and motorized forms of recreation. In our view, foot and horse travel should be viewed as the only methods of travel that have an unquestioned "right" to use any part of the forest; even then, there are times and places where total area closures are necessary to protect wildlife values." For their frankness, staffers at the state agency were forbidden last fall to talk to anyone about the forest plan. Greg Walcher, the governor-appointed head of the Department of Natural Resources, issued the gag order, though an agency spokesman insists that the term is inaccurate. The restraint is a procedural issue, says Todd Malmsbury, public information officer. In early January, thanks to a Freedom of Information Act request filed by reporter Heather McGregor, Walcher's position became public: The state wildlife agency backed away from taking any position, and statements from Division of Wildlife Director John Mumma and others warmly endorsing Alternative D are now deleted. So far, Forest Supervisor Martha Ketelle, has stood her ground. She also pointedly defends the congressionally mandated process, if not its conclusions. And she said at a forum months ago: "The plan can be changed." "She's honest, up front and doesn't talk the circular talk so many federal employees do," says Beverly Compton, of the Aspen Wilderness Workshop. "I believe it's Martha's personality that has made it possible for them to come as far as they have. She's fighting against strong opposition that is well-funded and that wants the status quo, adults who don't want to be responsible for their actions and impacts, and are mad that we do not want to deal with their consequences." Richard "Woody" Woodrow was the forest supervisor and architect of the plan that was issued in 1985. He was trained in forestry and began his career in Eagle, in the heart of the White River National Forest, helping build the big roads for timber sales. Now retired and still living in Glenwood Springs, Woodrow seems stung by the proposed changes to what he calls "my" plan. These days he's working for Colorado Republican Rep. Scott McInnis to possibly create a new alternative. Ketelle says that's fine as long as McInnis's forest alternative is inclusive and respectful of different points of view, just as she must be. That's a clear jab at McInnis's narrow list of invitees at two early meetings. Ketelle's message has been consistent: Compromise will be necessary, but so will change. The current plan, she says, never recognized that the forest's capacity could be exceeded; the plan that will be adopted in the year 2000 must recognize that. Angry mutterings and even hotheaded accusations may have flown in this White River debate, but absent has been the vitriol evident in Nevada's sagebrush skirmishing, where forest supervisor Gloria Flora felt driven to resign from her post on the Humboldt-Toiyabe National Forest (HCN, 11/22/99). District rangers dispute the allegation that the plan was dictated from Washington, D.C., a charge that could hurt Ketelle, since she is new to both the Forest Service and the White River. They say broad consensus existed within the agency about the need to rein in recreation, and Ketelle merely coalesced that vision. Furthermore, Ketelle's predecessor, Sonny LaSalle, remembered as a friend of the ski industry, says from retirement in Montana that he would have been just as determined about curbing off-road motorized use. "ATVs have a significantly greater impact to wildlife, as well as to water and soil resources, than do snowmobiles," LaSalle says. But some observers wonder if the congressional meddling won't get the White River decision watered down. Opponents, particularly the ski industry, have frequently complained directly to Forest Service Chief Dombeck and Regional Forester Lyle Laverty. Days after the plan was released, some Forest Service critics speculated that the agency had thrown out restrictive measures only to expect to retreat to a plan more acceptable to industrial-level recreation - Alternative C. Some suspect that the "C" stands for greater compromise with industrial recreation. Jasper Carlton of the Biodiversity Legal Foundation warns against compromising protection for the Canada lynx, which may one day be listed under the nation's Endangered Species Act. (On Jan. 8, a decision by federal agencies was delayed for the second time.) His warning counts: Carlton files lawsuits the way most people file expense vouchers, and he usually wins. His not-so-subtle message is that recreational abatement will be a matter of law, not policy, as long as the Endangered Species Act is around. The sleeper so far in this forest-planning fight has been enforcement. The Forest Service admits it can't enforce the road closures it has now. This is particularly true during hunting season, still the time of heaviest use even on a New West forest. "You have to have a pretty unlucky day to get caught by us," says Bill Johnson, assistant district ranger in Eagle. Tom Healey, one of just three law enforcement officers on the forest, admits that you might be more likely to be struck by lightning. The proposed new forest plan assumes a continued budget of $11 million, despite an estimated $18 million needed to implement it. Agency employees talk about making up the shortfall through partnerships with locally based forest-user groups, education about a land-use ethic and more signs on forest roads and trails. But from past experience, signs can't do it alone. Ask any White River Forest user, and he or she will tell you that signs reading "closed" often end up smashed on the ground. Allen Best has been writing about White River National Forest issues since 1985 and recreating on it since 1977. He now splits his time between the Vail and Denver areas. ... plus several short sidebars with stakeholders sharing their views in their own words, available in the "Sidebar" section of this online issue. * Find the entire Proposed Revised Land and Resource Management Plan on the Internet: www.fs.fed.us/r2/whiteriver/planning.html. The Forest Service has some CDs and many forest plan summaries; call 970/945-2521. Full documents can be found at many locations on Colorado's Front Range: At university libraries in Fort Collins, Golden, Boulder and Colorado Springs (CU campus) and the Denver Public Library, as well as at Forest Service offices in Fort Collins, Lakewood and Pueblo. * Contact Jeffrey A. Berman, president, Colorado Wild, P.O. Box 1525, Boulder, CO 80306 (303/546-9911; fax: 303/546-9922), or see the Web site, www.coloradowild.org.